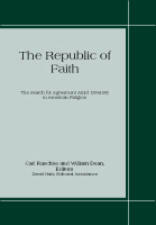 Title: The Republic of Faith: The Search for Agreement Amid Diversity in American Religion Author: Carl Raschke and William Dean, eds. Imprint: The Davies Group, Publishers soft cover 166 pp. USD 18.00 ISBN 978-1888570717 January 2003 The set of articles and essays included in this volume address issues that have been raised as an ongoing agenda by a national organization of scholars, clergy, and citizens. The name of the organization is Res Publica. These papers were presented at the organization’s inaugural conference in Aspen, Colorado at the end of November in 2001, and represent different “takes” on the role of faith in American public life and the question of how one achieves a sense of “commonality” within a culture of proliferating religious diversity. Contents Jean Bethke Elshtain, The Liberal Social Contract and the Privatization of Religion Lewis S. Mudge, Redescribing Social Inclusion: Underrepresented Ethnicities and a New American Identity Eldon Eisenach, Narrative Power and Liberal Truth in Building a New Consensus Alan Mittleman, American Jews and the Public Square: Notes for an American Jewish Public Philosophy Mary Doak, The Significance of a Contemporary Catholic Debate for American Public Life John B. Cobb, Jr., The Meaning of Faith in Public Discourse John Quiring, Liberal, Conservative, Progressive Dialogue William R. O’Neill, S.J., Public Reason and its Religious Discontents Thomas A. Idinopulos, Television and Violence The Editors Carl Raschke is Professor of Religious Studies at the University of Denver and co-director of Res Publica. He is the author of The Digital Revolution and the Coming of the Postmodern University, Fire and Roses: Postmodernity and the Thought of the Body, The Engendering God, and The End of Theology. William Dean is Emeritus Professor of Constructive Theology at Iliff School of Theology. He is the author of American Religious Empiricism, History Making History, and The Religious Critic in American Culture. He is also subject editor for The Dictionary of Modern American Philosophers, 1860–1960.